With the launch of The Escapists 2: Pocket Breakout on iOS and Android, we wanted to help all new escapists make their way to freedom. 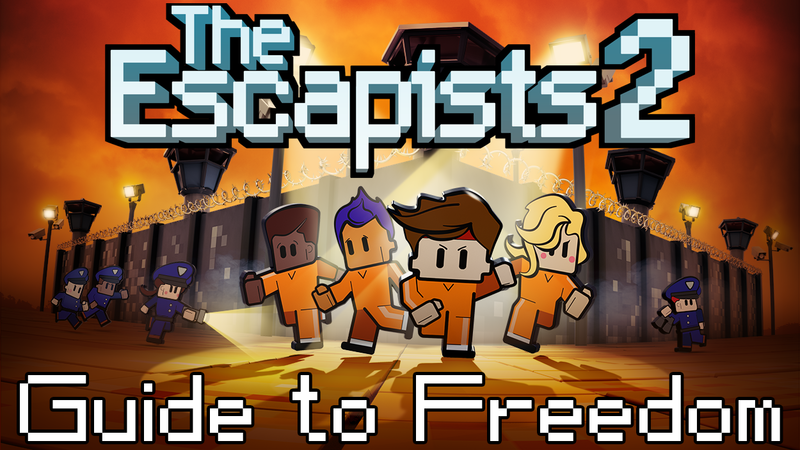 Once you’ve played the game’s tutorial, Precinct 17, you might still have some questions – and that’s where our The Escapists 2 Guide to Freedom comes in. This FAQ is not going to spoil every escape or teach you how to do absolutely everything, but will hopefully teach you just enough to be able to (flawlessly) plan and execute your most daring escapes. Let’s get started! – Play Center Perks 2.0 first. This prison has an inmate named Robinson (look out for a red exclamation mark), who can teach you the ropes. – Make sure to attend roll call. Any other routine only needs to be attended for a second (or not at all if you don’t mind a bit of heat). – Check favour “quest lines” and in-game pay phones for tips on unique escape opportunities. – Consider if your escape is best done during Lights Out. A Bed Dummy and bed sheets on your cell bars will hide the fact that you’re not where you should be. – Any items required for unique escapes spawn in at least one desk every in-game day. Be sure to look everywhere including behind locked doors. – Items with a red background are considered contraband. Don’t take those through contraband detectors and don’t leave them on the ground for guards to find. – The quickest way to make money is by doing favours. Alternatively, get a prison job or simply sit down in the chair of the job office to get a bit of free money during Job Time. – If guards are chasing you, hide in a locker. Provided they don’t see you enter, you can stay there until your heat is <70 (or <80 if you don’t mind potentially being followed by guards) and then safely exit. – When engaging in combat, make use of both normal and charged attacks, blocking and locking on to your target. Precinct 17 can teach you the basics. While you do have access to a couple of prisons from the beginning, we do encourage you to start with Center Perks 2.0. Not only is this an “Easy” prison, it also has a very special prisoner who can teach you the basics of perimeter escapes. Look out for the inmate named Robinson, who will have a red exclamation mark above his head. Speaking to him will initiate the perimeter escape tutorial, from where you can select one of three types of perimeter escapes. Do I have to attend these prison routines? Prison life dictates that you must do everything the guards tell you to do, like attending the various routines during each in-game day. Luckily the guards have their hands full with every other inmate already, so it’s totally fine if you just show up to a routine for a second just to get the checkmark, and then be on your way. You can even skip most routines entirely if you’re busy doing something else. Missing a routine increases your heat which can make guards suspicious of you, but in most cases that’s not a big problem at all. Just don’t miss roll call. Missing that will result in a prison lockdown and you in solitary confinement peeling potatoes. You’ve been warned! Beyond the perimeter escapes, each prison has unique single- and multi-player escapes. There will be small hints around the prison to show you where and how these can be pulled off, but if you want some pointers, check the in-game pay phones. These will allow you to buy both escape tips as well as secret crafting recipes. If you can’t quite afford to buy tips just yet, look out for a green exclamation mark above inmate heads for available favours. These are not only great for making money, but some of these are quest lines (as indicated by 1/5 for instance) that in some cases can lead to unique escape opportunities. Keep your eyes out! Oh and if electrified fences are in your way, look for something that might be generating their power. When is the best time to escape? Depending on the type of escape you are doing, you might want to consider doing some of it during Lights Out. The guards will have you believe that you must stay inside your cell during this time, but that isn’t true. A crafted Bed Dummy and/or some bed sheets on your cell bars will help you hide the fact that you aren’t where you’re meant to be. You can either hide somewhere during the RETURN TO CELL phase or leave your cell through a destroyed wall or the vents. Just make sure not to be seen by any guards (or guard tower search lights) or you’ll meet the painful end of a virtual baton. Where do I get the items I need? There are several ways of gathering items, but the main one is by looting any desk you see. Every desk will hold random items and each desk inventory will randomly spawn new items each in-game morning. This means that if you can’t find what you’re looking for, try again the next day. In general, make sure to check absolutely every desk. Items required for specific crafting recipes might have spawned in a desk behind a locked door. Anything needed for an escape, like the bolts in Rattlesnake Springs, will spawn somewhere every day. Be thorough and look everywhere. Desks aren’t the only places for items, however. If you see an unconscious inmate or guard, sneak a peek in their inventory to see if they have something of interest. Just make sure no guards catch you stealing! If you need both items and money, favours should be your go-to. A lot of favours will include retrieving or crafting sometimes powerful and rare items, and if you’re devious enough, you could cancel the favour and keep the item. Don’t worry, we won’t tell anyone. The final way to get items is by buying them. You will notice some inmates with a coin above their head. This means that they have items for sale for a limited time. Which inmates are selling items, what they are selling and how much it costs, is all random. Keep checking back if you’re looking for something specific. There are a lot of items in The Escapists 2 and many of these can be crafted by players. Items you’re almost guaranteed to need, at least for your perimeter escapes, include the Pickaxe, the Cutter and the Shovel. These come in different tiers with higher tiers featuring a higher durability. One of the key steps in preparing for an escape is to find out which items you’ll need to pull it off. Look at the recipes to figure out which items you’ll need to keep an eye out for as you’re looking through desks, inmates and guards. Another thing you might want to craft is a good weapon. You can see the statistics of each weapon in the item description, so we’ll leave it up to you to find your favourites. Keep in mind that some weapons are contraband and others aren’t. This can be important if you need to go through a contraband detector to take on the guard or inmate you’re looking for. Any contraband you might be carrying if you get knocked out and taken to the infirmary will also be removed from your inventory. With this in mind, the most powerful weapon isn’t always your best bet. Consider your options carefully. Finally, before you start crafting you’ll need to ensure you Intellect is high enough to create the item(s) you require. Look out for any bookshelves (look out for the book icon on the prison map) that allow you to increase this stat. You’ll notice all the recipes in the crafting menu being divided into several Intellect tiers, so depending on the item(s) you’re looking to make, you’ll need to increase your stat to a certain level. Unlike statistics in The Escapists (1), your Health, Stamina and Intellect will not decrease over time in The Escapists 2. – Don’t go through a contraband detector with contraband on you or you will set off an alarm. You can avoid this by crafting and carrying a contraband pouch, which will hide your other contraband items. Take note of the pouch’s durability which decreases each time you pass through a detector. – Contraband dropped on the floor will be taken by guards if spotted. You can safely store normal items on the floor, however. – Make sure you hide your most important contraband in the hidden compartment in your personal desk. This keeps it safe in case your cell is searched by guards. – Get a prison job. Check the job board in or near the job office to find available jobs. If a job you want is unavailable, look up who has it and make sure they’re unable to complete their job quota during the next Job Time routine. That will get them fired, which will allow you to swoop in provided you meet the strength and intellect requirements. – If you don’t have a job and would rather spend job time getting up to no good, you can get a bit of free money simply by going to the job office during Job Time and sitting in a chair for a couple of seconds, until you receive 10 coins. – The quickest way to make money is by completing favours for other inmates. Look out for anyone with a green exclamation mark above their head and simply complete the objective(s). How do I stop the guards from chasing me? If guards are actively chasing you because your heat is high, find and hide in the nearest locker. Provided the guards don’t see you enter, you can stay there until things cool down. It’s generally safe to exit a locker once your heat is 70 or lower (or <80 if you don’t mind potentially being followed by guards for being suspicious). If you’re dealing with guards that just casually follow you around, consider bribing them to increase their opinion of you. Interact with the guard and select an item to Gift them. You can donate any item in the game. This works on inmates too. How do I survive fights? – There are two different attacks; the normal attack and a charged attack. By holding the attack button, you can charge an attack, which does considerably more damage. You can also use this to close the distance between yourself and your opponent. – Lock-on to your target if you’re struggling to hit. Locking on can make the charged attack considerably easier to use as well. – Block, block, block. Blocking might use up your Stamina just as attacking does, but you’d rather lose your stamina than your health, right? – If you’re still struggling or if you know you’ll be engaged in a longer fight, consider bringing consumable items to replenish your health and stamina. There’s no shame in planning ahead! That’s it for our The Escapists 2 Guide to Freedom. We hope this FAQ improves your time on the inside all while helping you plan your future escapes. Godspeed, inmates! If you have any feedback to the guide or have any tips of your own that you think we should add, let us know on Twitter and Facebook. You can also chat to us and other escapists on the official Team17 Discord server, where over 8,000 gamers are talking about The Escapists 2 and other Team17 titles. We look forward to discussing virtual prison life with all of you. The Escapists 2 is available on Steam, PlayStation 4, Xbox One, Nintendo Switch, iOS and Android.